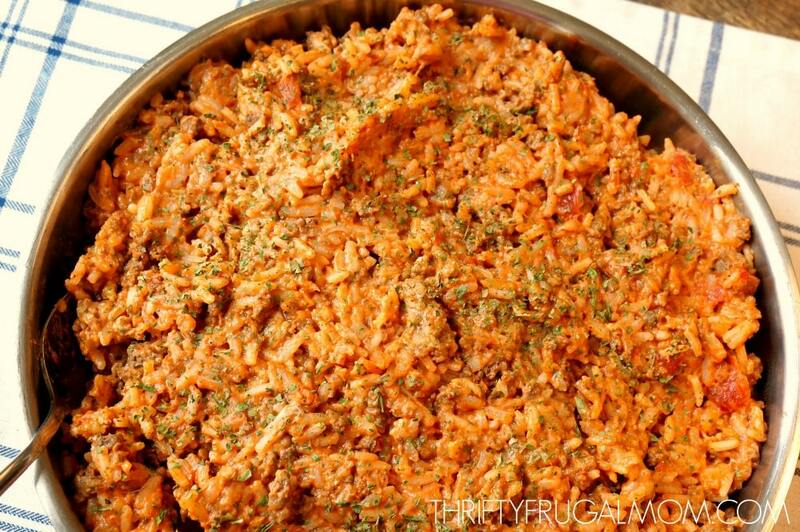 This kid friendly Easy Ground Beef and Rice Skillet recipe takes just 7 basic ingredients, is budget friendly and deliciously satisfying! What’s not to love?! Skillet meals such as my Creamy Sausage and Potatoes and Speedy Spanish Rice and Ground Beef Skillet have been making an appearance on our menus ridiculously often the last several weeks. It’s partly because it’s just so incredibly hot that I don’t feel like baking anything (and we have no grill). Partly because I just haven’t been in the mood to spend much time in the kitchen and skillet meals are the best for being fast and easy. 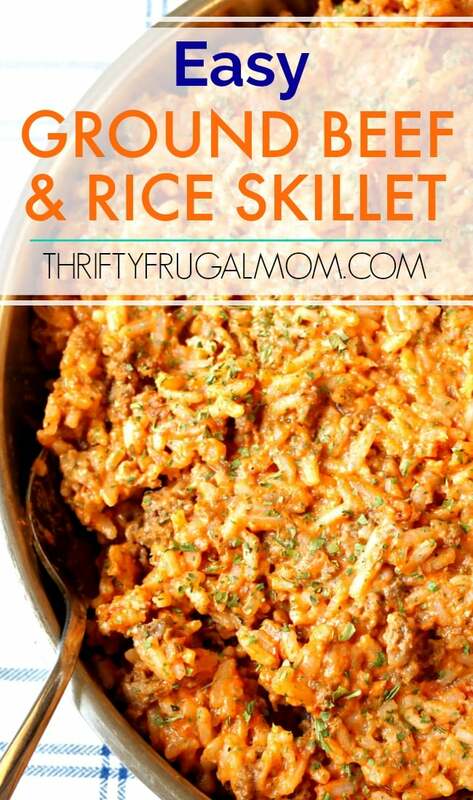 And partly because I have a bunch of skillet meal recipes that we simply really like and I know that they’ll always be a win with the kids. So, it just kind of feels like a no-brainer to make them often right now! 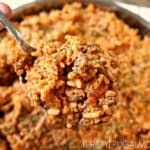 This Ground Beef and Rice Skillet is another one of the recipes that has been getting made a lot too. 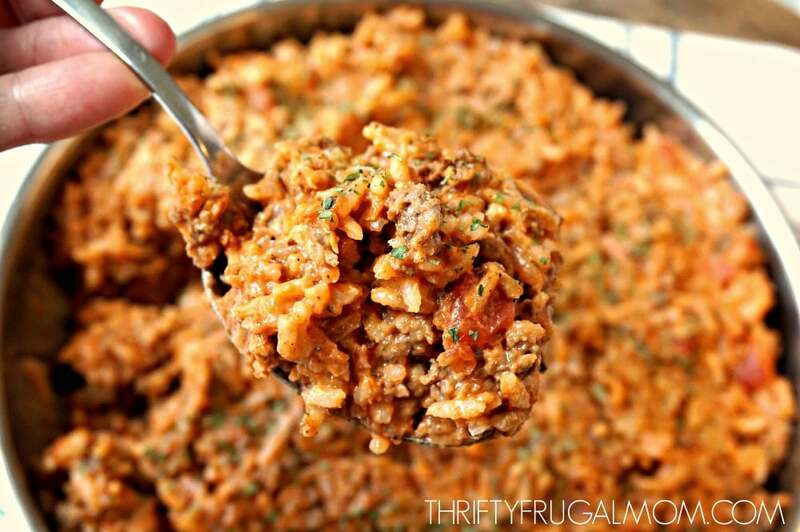 I actually considered calling it Busy Day Beef and Rice Skillet because it’s one of those recipes that I find myself falling back on when I have a busy day, don’t have much time for dinner prep and just need a simple, family friendly meal. Other than frying up the ground beef, it’s really a hand’s off dish. And I love that! And don’t be scared to experiment! Recently, I only had 2 oz. of cream cheese so I added a big spoonful of cottage cheese to make up for the missing ounce and it ended up being very tasty. I’m guessing that you could also sub sour cream for a little bit of the cream cheese too. 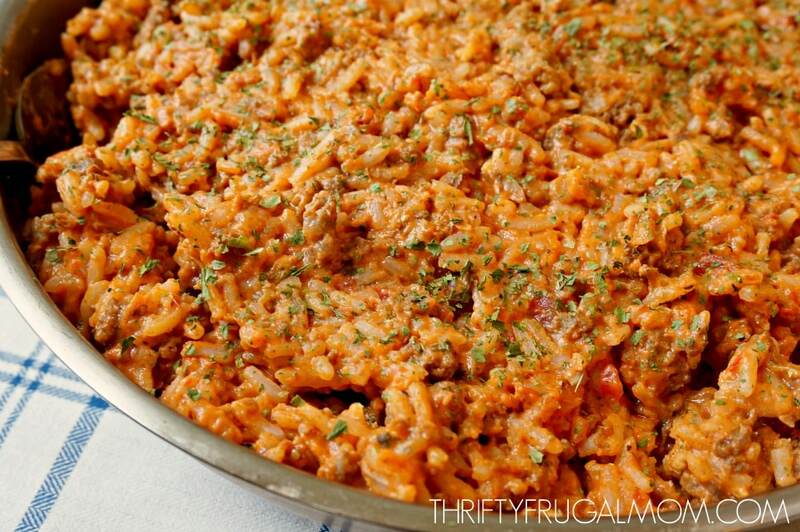 I also love that this Easy Ground Beef and Rice Skillet is budget friendly! I mean, who can’t appreciate that? 🙂 In fact, going by Aldi’s prices, you can make this whole recipe for right around $5. That means it costs less than $1.00 a serving! One more thing. Because this is made with just a few simple, basic ingredients, using a quality, flavorful pasta sauce is key to giving it a good flavor. I originally made it with just plain old tomato sauce, and while it was good, I discovered that it’s a lot tastier if the sauce is seasoned well. I often have the Classico Roasted Garlic pasta sauce on hand and it is my favorite for this recipe! In skillet, cook ground beef and onion until browned; drain. Stir in rice, water and salt. Cover and simmer until water is absorbed; about 15 to 20 minutes. Stir in cream cheese, pasta sauce and chili powder. Using a nicely seasoned pasta sauce really makes this tasty! I love using one that is seasoned with garlic and herbs. Sounds delicious and easy. We don't eat beef, but I bet it would taste good with ground turkey. I also want to add that I've tried a number of your recipes and have had excellent results. Thanks so much for sharing them. This week I made the granola, and it came out so well that I will never buy another box of cereal. Do you use the minute rice or the Uncle Ben's version? Always looking for easy meals to take to my parents who are in their nineties. Looks Delish! Sorry for the slow reply, Terry! I somehow missed you comment until now. I actually used regular Jasmine rice, but regular white rice should work too. If you use the minute rice, I'd probably only add 1 1/2 c. water and keep your eye on it and add more only if needed. Minute rice cooks more quickly and doesn't require as much liquid if I remember correctly, so my only concern would be that it wouldn't soak up all the liquid. Hope your parents enjoy it! This looks so good, comforting and relatively easy and fuss-free. I definitely want to add this to a future meal plan. Thanks for sharing! Your first sentence pretty much sums up this recipe and why I love it. :) And the fact that my kids all love it too is a big win as well. Hope you all enjoy it as much as we do! Great cheap, easy recipe!! We will definitely be having this again!! I added extra chili powder, and next time, I will add black beans to it!! Hubby enjoyed it with crumbled corn tortilla chips and sharp cheddar!! Thank you for sharing this recipe! Oh, I love the idea of adding black beans! And the corn chips and sharp cheddar? Yum! Now you have me wanting to try this as a hay stack of sorts...topping it with corn chips, cheese, lettuce, salsa and salad dressing. I bet it would be really good! This looks quick and easy. Perfect for busy nights. I am putting it on my menu. Thanks!